Sometimes we need to quickly check the permissions on any database object, below script will help you to extract this information. Note: use Ctrl-Shift-M to replace template parameters. Though the above method displays the desired result we can not filter the result, to filter the result based on different parameters there is an alternative method as shown below. Microsoft SQL Server 2008 Service Pack 4 (SP4) and SQL Server 2008 R2 Service Pack 3 (SP3) are now available for download. In my previous blog post i have demonstrated how to find first and last date of any month. 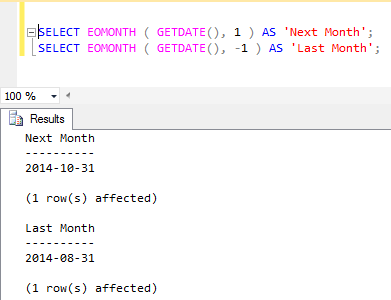 SQL Server 2012 has introduced a new date function EOMONTH to find the last day of the month. Date expression specifying the date for which to return the last day of the month. Optional integer expression specifying the number of months to add to start_date. SQL Server doesn’t provide any function to find start of the month, but we can make use of EOMONTH function to find start date of any month. EOMONTH function is available in SQL Server 2012 and higher, for SQL Server 2008 R2 and below you can refer to this blog post. As a Part of my routine DBA activity, I have to go through sp_readerrorlog to locate errors if any. In our production environment we have have Both Failed and Successful logins auditing enabled. Hence if i run sp_readerrorlog without any filters it would return me huge no of rows and go through each and every row is a time consuming and repetitive activity. Here i would like to share how we can quickly go through Error Log with few filters. sp_readerrorlog takes 4 parameters to narrow down our search. @p1 – Log file we want to read, 0 = current error log, 1 = Archive #1, 2 = Archive #2 etc..
@p2 – 1 or null = SQL Server error log, 2 = SQL Agent error log. @p3 – string which we want to search. @p3 – string to further refine our search. I basically filter one day error log as below. You can also refine your search just to check database backups like below. As sp_readerrorlog is undocumented stored procedure to review error log, you will not find any official references in Books online. Keep your current error log under control just by recycling it, so that you can quickly retrieve its output, refer sp_cycle_errorlog.